At the peerless boozer Salon Des Amateurs some of the most forward-looking artists of contemporary club music fix a meeting to let the future groove. From Hamburg Die Vögel (English: The Birds) come to play a form of dance music that is not yet branded. With musicality and wicked sense of humour the duo blends House and Techno traditions with an organic brass sound that will let you march until the end of the night. Not the kick drum is the king – no – growling trombones and tubas tell you in team play with synthesized sounds and thrilling four-on-the-floor grooves to paint the town red. 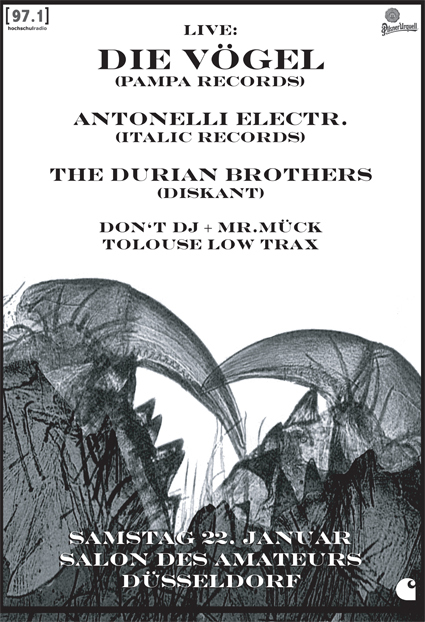 The other two acts of the night are Antonelli Electr. and The Durian Brothers. The former is a long term renovator of Techno music, a man that likes to play delicate rhythms with an edge that force you to move like you never did before. The latter deliver a pie in the sky with two prepared record players and brisk sequenzer sounds. Polyrhythmic vanguard music for hungry dancers that have enough of streamlined party rhythms without deepness. Just in case you like it avant-garde: buy a train or plane ticket and drop in. Before, in between, and after the show the DJs Tolouse Low Trax, Mr. Mück, and Don’t DJ assure on top that everbody finds their costs repaid.